I haven't been gardening that long, so my plant knowledge is limited. But the funniest thing keeps happening: once I finally notice a plant exists, I see it EVERYWHERE. Case in point: I was at my friend Jason's house, exploring his front garden. 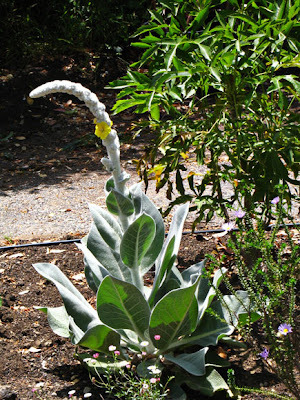 He had a giant silver mullein, Verbascum Bombyciferum, doing its freaktastic fuzzy phallic blooming thing. I went out the next day and bought one at Garden Fever. Mine won't bloom until next summer but I'm stoked that I have one now. Once I knew it existed Ryan blogged about it, Loree blogged about it, and I see it in gardens around town. How did I not know this plant before?! I've said it before: everything is more magical when you go through life not really paying attention. Now I want one. They usually have a number of mullein at the Chicago Botanic Garden's English Garden. Supposed to be great for attracting finches. They are wonderful to touch, as well. I'd been pondering the use of lamb's ears in the garden, but they are so thuggish. I'm thinking this guy is a better option (assuming it self-seeds next year). So funny...I've had the same thing happen...sometimes it's even that I won't like a plant for the longest time...then I see it used well somewhere...and I fall in love with it! The same thing happens to me. Some plants I can understand, but this one?! It really sticks out. Yup, I know that phenomenon too! That's a cutie. I had a cool mullein that I bought from Annies' Annuals a few years back but it has vanished in the plant graveyard that is my north border. Used to hate it...love it now. Am I really that suggestible? It seduced you. It certainly has the look. Are all mulleins biennials? I'm hoping that if I buy a second plant next year I could maybe always have one blooming in the years to come. Yes! I tend to hate all the plants we had in our yard growing up: calla lillies, callistemon, juniper. But then I see one in Jane's yard or Loree's yard and I fall in love with them. I know! How do you miss a plant like that? I have some serious blinders on. I love love love lambs ears! They are kind of weedy in one part of my yard but I don't really care. I'm bummed, I accidentally killed the pot of Helen Von Stein Stachys that I got at the plant sale. THIS "everything is more magical when you go through life not really paying attention" is purrrfect ! I'm always sort of being poked at for never having a clue (like when Drew planted TWO gardens in our mud filled yards, I walked right by BOTH, d'oh). I also relaughed at the garden tool on roof. Apparently our stucco guy just found a bunch of tools on our roof-- I had no part in it though, happily (for once). And that mullein, it looks so funky! What a fun plant. It is shockingly easy to leave things on the roof. It's so weird.